Double-click an MP3 file. Double-clicking an MP3 file on your Desktop or within File Explorer loads the program associated with MP3 audio on your system. By default, this program is Windows Media Player, but if you installed another MP3 player — such as the excellent Apple digital audio player iTunes — Windows plays the file with that program instead. Right-click an MP3 file and choose Play from the menu that appears. Run Windows Media Player. You can always display the tracks you added to your collection by clicking the Music entry in the Navigation pane on the left of the window. To play a specific song, double-click it in the track list. 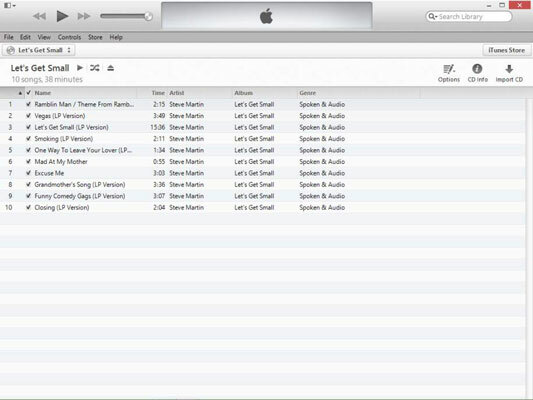 You can also switch between displaying songs by artist, album, and genre. 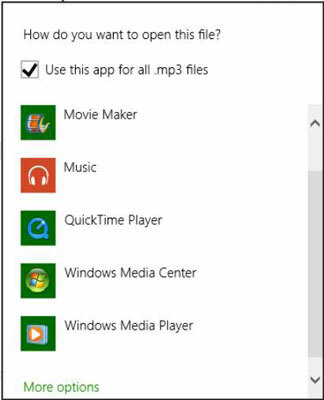 If Windows 8 is using the wrong application to play MP3 files — for example, you installed iTunes but you want Windows Media Player to run when you double-click an MP3 file — it’s time to change the association for the file. Right-click the MP3 file within File Explorer, choose Open With from the menu that appears, and then choose Choose Default Program to display the Open With dialog box. Make sure that the Use This App for All .MP3 Files check box is selected and then click the application with which you want to play your MP3 files. To skip to the previous and next tracks, click the Previous and Next buttons on the Media Player control strip at the bottom of the window — huge surprise there, right? MP3s are easy to pause while you’re retrieving your toaster pastry or pouring another soda. Just click the Pause button to pause the audio and click it again to restart the playback. You can also create a group of songs — a playlist — and return to that group at any time in the future (a great feature if you like to match your music to your mood). To create a playlist, click the Create Playlist button on the toolbar. Media Player adds a new unnamed entry under the Playlists heading at the left of the window, ready for you to type a descriptive name. Press Enter to save your name and create the playlist. Now you can add songs to your new playlist: Click the Music header at the left of the window to display your song collection and then click and drag track names from your library to the playlist entry in the Navigation pane. You can drag as many tracks as you like, and you can click and drag the track titles within your playlist to rearrange them! To load that playlist in the future, just click the playlist name in the Navigation pane.